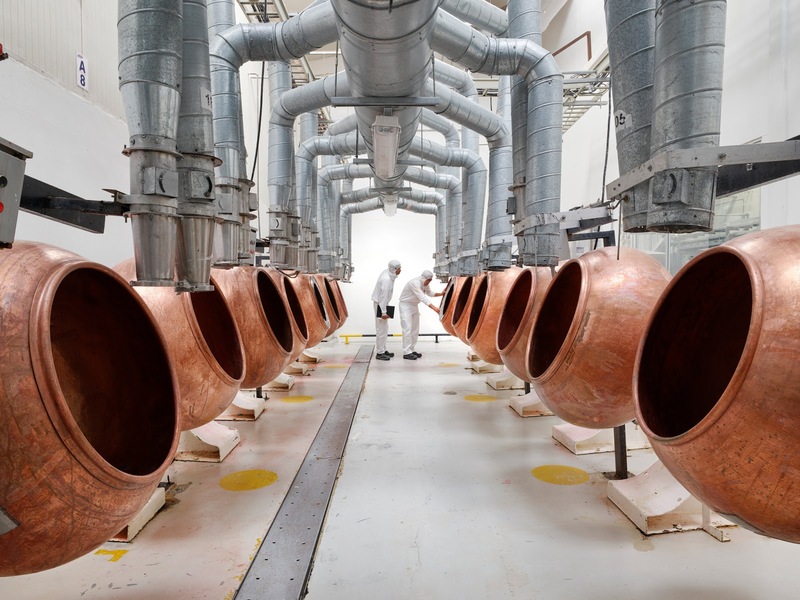 One of Colombina’s panning rooms, where workers manually pour ingredients into kettles in order to add colored coatings and hard shells. 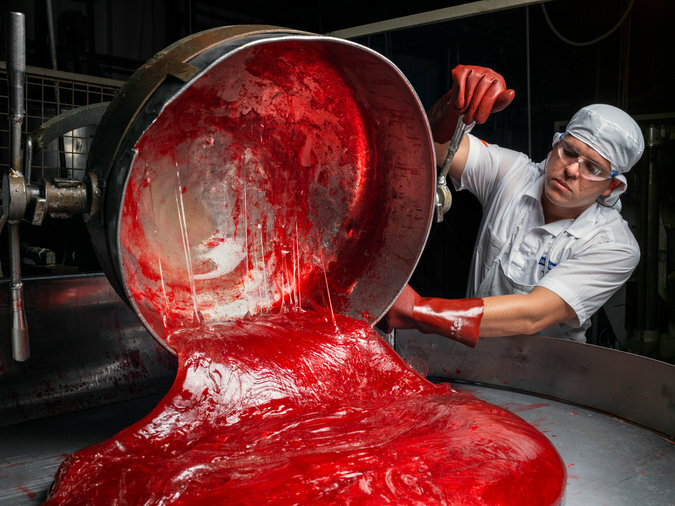 Cherry-flavored Tiger Pops are removed from a press before being wrapped. 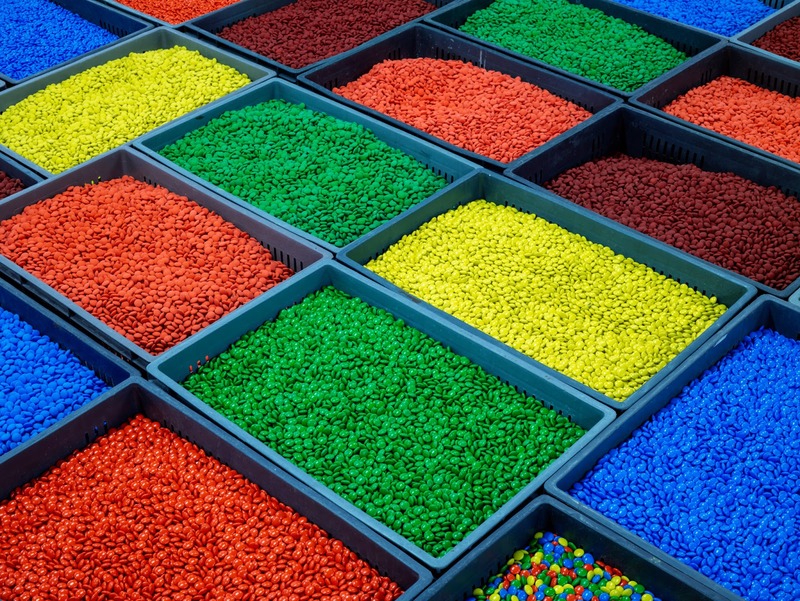 This vat adds the colored coating and shells to candies, like these M&M-like Choco Disks. 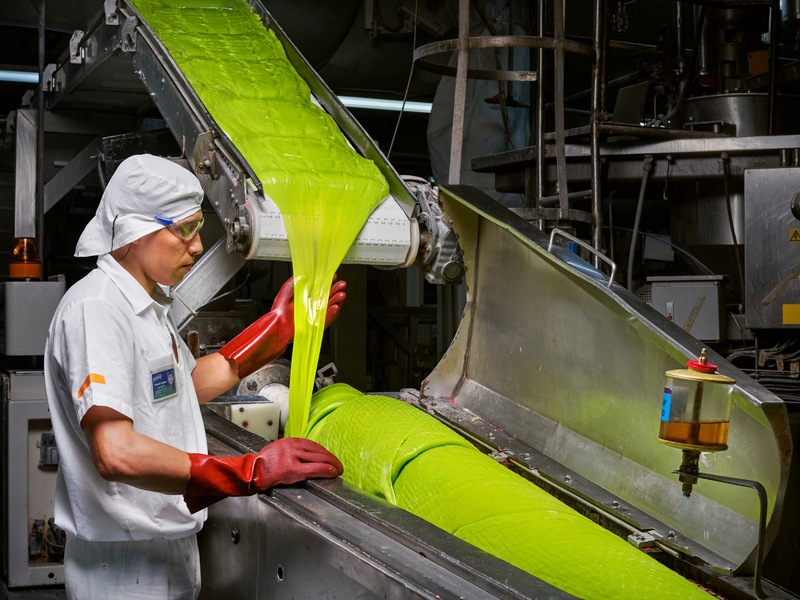 The pan turns clockwise to mix the contents, and its speed will determine the texture produced. 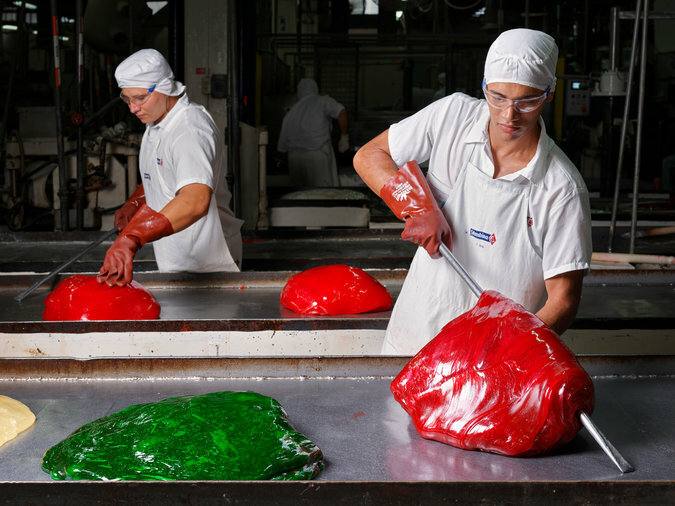 Workers placing bear-shaped gummies on a conveyor belt to be covered in chocolate, to create ChocoSplash. 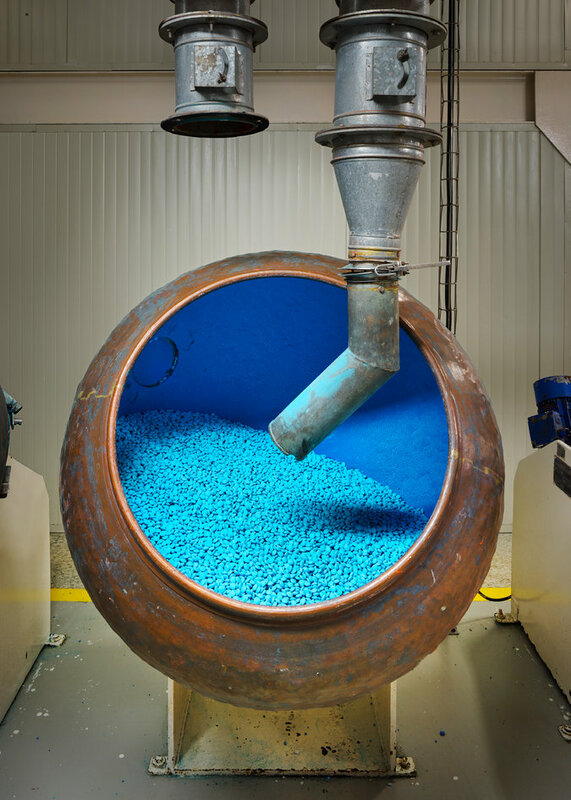 Pouring of candy mixture from a kettle onto cooling table. The candy is called caramelo at this stage. After being cooked in large kettles, the caramelo is poured onto a table and hand-turned to cool and mix the flavors. 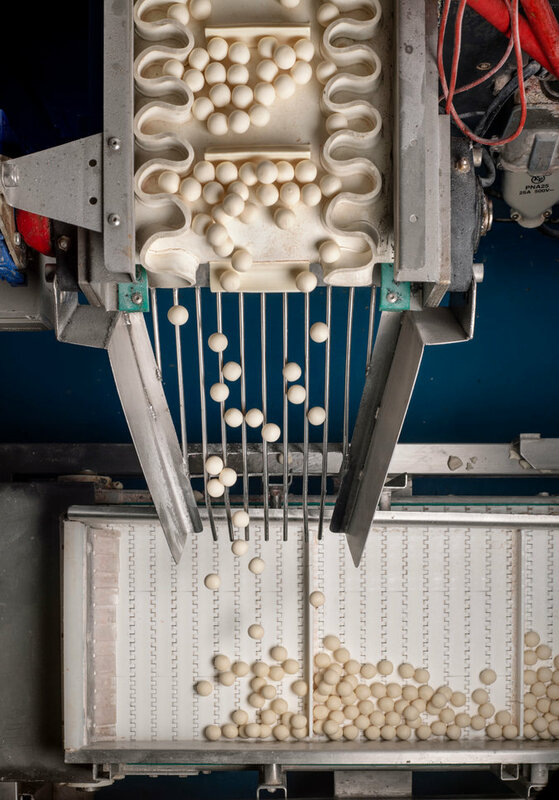 Candy is fed into a batch roller and gets rolled until it becomes a small rope, from which the lollipop balls are cut. The mixer for Max Frulato Caramelo Blando candy. 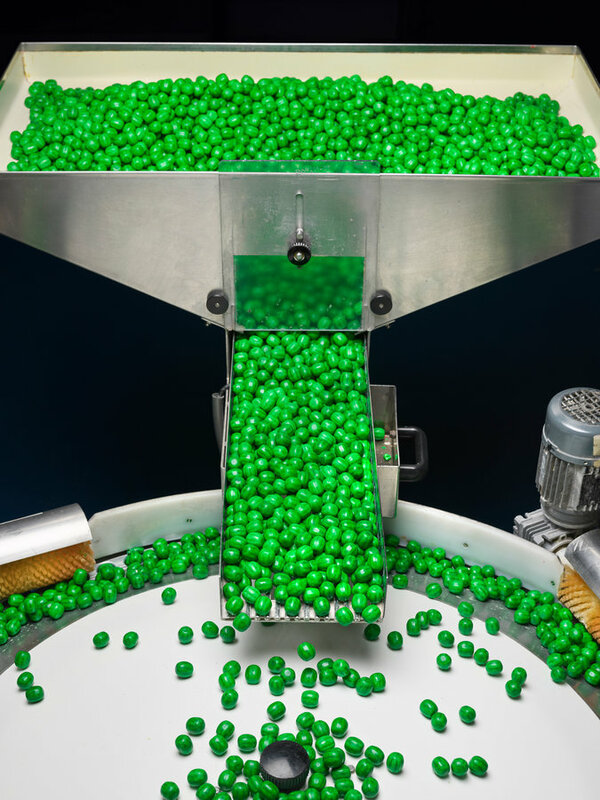 Gum balls being sorted before they are coated. 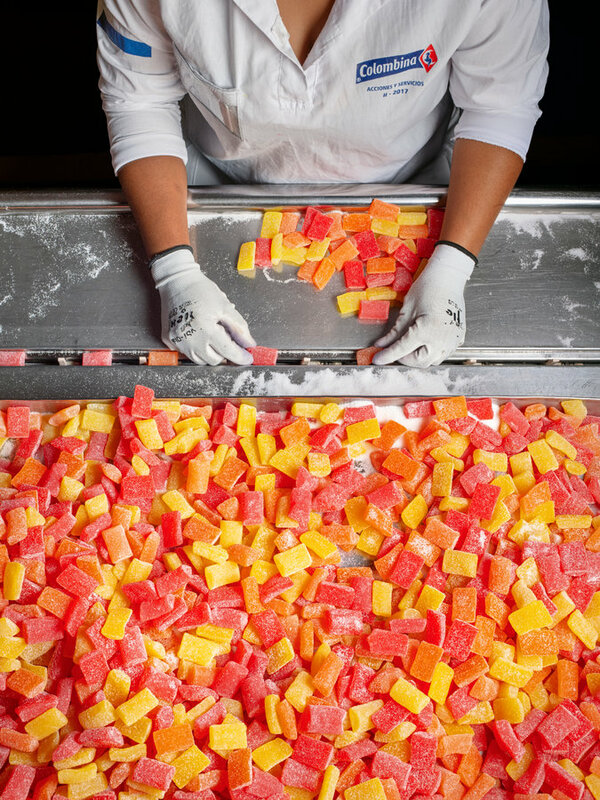 Extrusion of bubble gum that will go in the center of Bon Bon Bum lollipops. 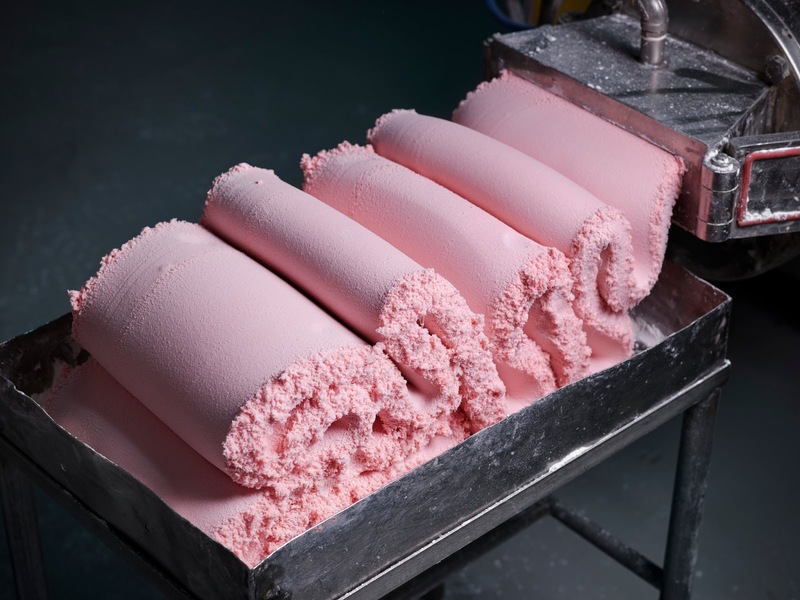 Extrusion of bubblegum that will go in the center of Bon Bon Bum lollipops. 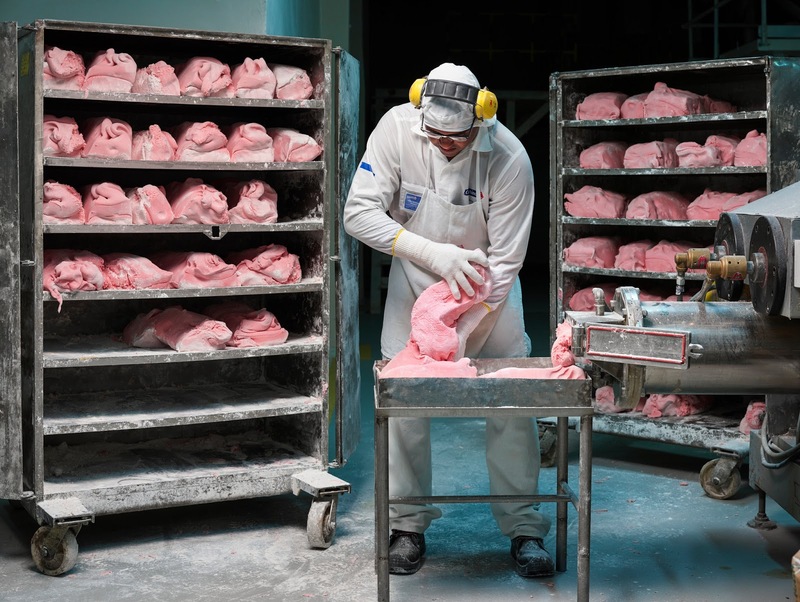 The gum is cut into loaves before being moved to the hard-candy department. Choco Disck Chocolate Lentils inventory. This chewing gum is watermelon-flavored with a sour filling. 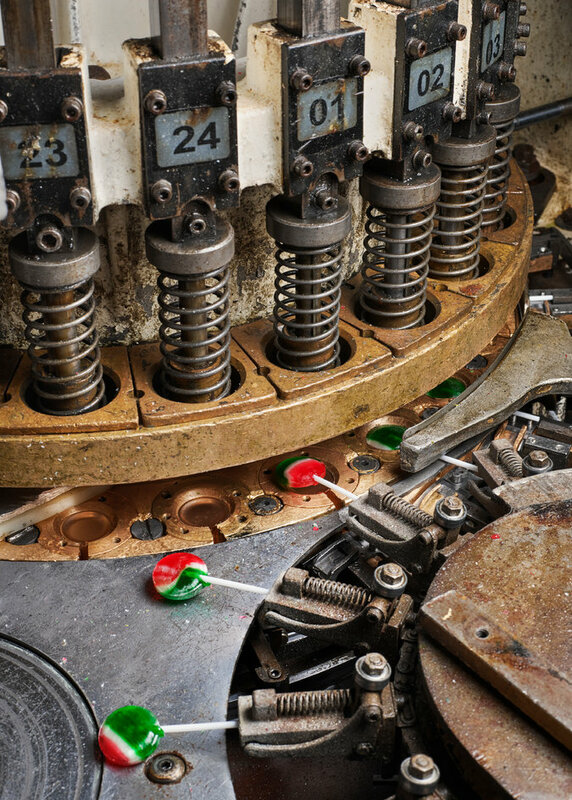 The rotating disc guides each piece into a hole where the candy is wrapped by a machine. 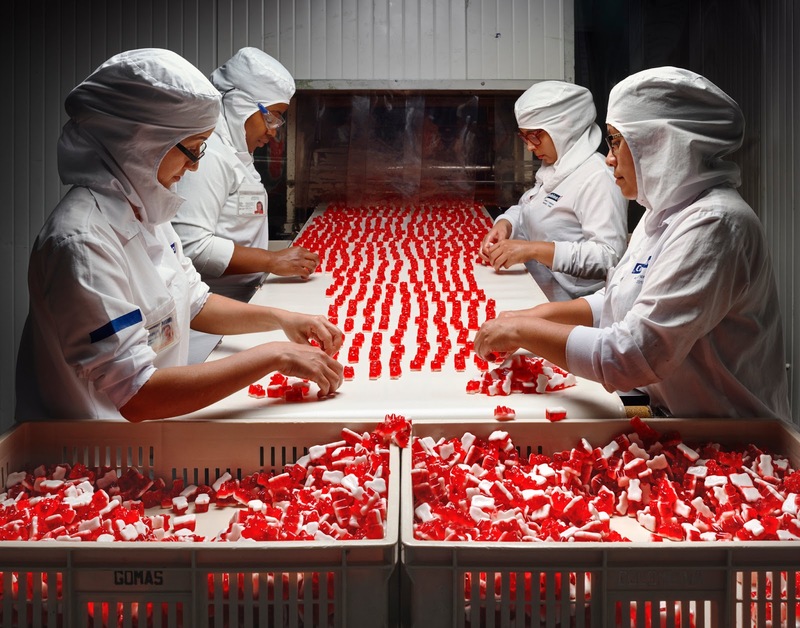 A gummy called Feria, one of the first gummies produced in the Colombina Cali factory.